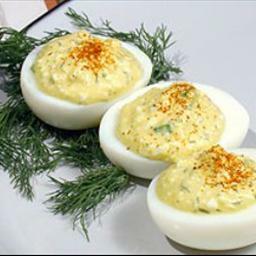 Cooking with Kimberly: Bacon and Egg Deviled Eggs. Gently boil the eggs for 10 minutes. Rinse them under cool water. Let them sit for a few minutes before peeling. Cut eggs lengthwise into halves. Slip out yolks with the edge of a spoon and mash with a fork. Mix in mayo mustard, bacon and salt and pepper. Fill egg halves with yolk mixture, heaping it up lightly. Sprinkle each one with paprika.